This set of Clip Art includes over 700 clip art graphics in color and black and white. The graphics are high quality 300dpi transparent PNG files. 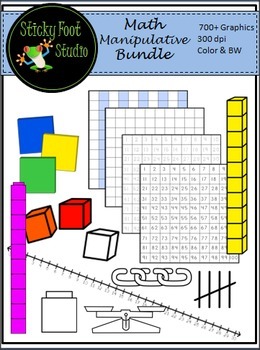 These manipulative objects and graphics are used frequently in primary grade classes. If you enjoy my clip art, please follow my store. You'll be the first to know of my latest clip art sets, freebies, and sales. Thanks and enjoy! I hope you enjoy this math set and find it useful! All Sticky Foot Studio clip art is created by Claudia Kisara and husband Daniel. 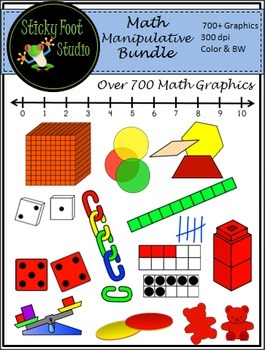 You may use these graphics for educational products sold digitally. Provide credit to my store by including a link or by using the graphic logo which is included in this download. The graphic logo can also be downloaded from my online stores. Please contact me with any questions in the 'Product Q & A' section of this page.